A motorcyclist is riding on a one-way street in the middle of town near where she lives. She has ridden her bike along this street hundreds of times in the past. It is well familiar to her. As she approaches an intersection, another one-way street, where there are stop signs preventing traffic from entering from her right - she has the right of way - and she knows from experience that it is not a busy intersection. She finally notices a car easing its way into the intersection. Shortly thereafter she died - after she collided with that car. Speed limit on the street she was riding on was 30 mph. 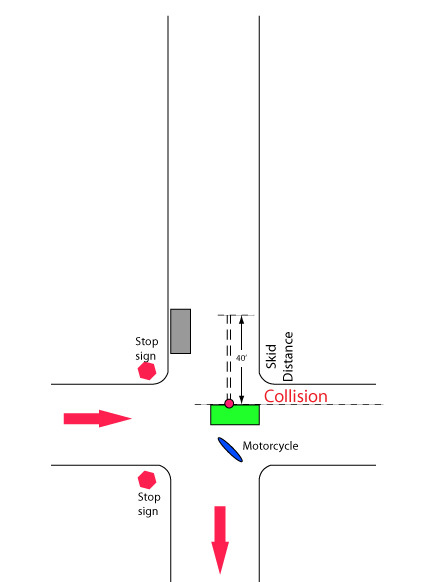 The crush damage to the vehicle and motorcycle suggest an impact speed of about 40 mph. She left a 40 foot skid mark before the collision. Oh, did I happen to mention that there was a double-parked delivery truck near the intersection on her right side? Witnesses, including the driver of the car, claimed that the truck obscured sight lines. The driver of the car was uninsured. The estate of the deceased hired an attorney seeking monetary relief. After all, the lady died and "it wasn't her fault". So what if the driver of the car she struck was uninsured? You guessed it - they sued the trucking company claiming that their double-parked truck caused this accident. The trucking company, after all, had 'deep pockets' and nobody else did. 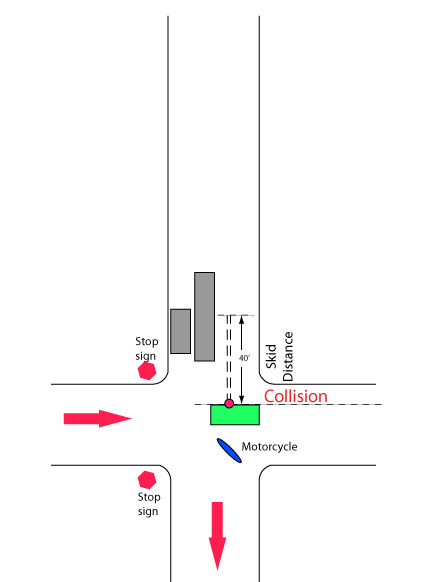 Witnesses agreed that the car properly stopped at the stop sign then inched forward until it was almost all the way across the intersection. Other witnesses disagreed about the presence of the double-parked truck. Some placed it five miles away from that intersection at the time of the accident, based on GPS data recorded by the company. Others said the truck had been there earlier than the accident. Still others said that the truck was definitely there at the time of the accident. Most states have laws which allow for contributory negligence to be determined and affect monetary compensation. If, for example, the trucking company can show that its negligence in the matter, if any, was less than 50%, it is possible that it would not be liable for any financial costs. What did the police who investigated this accident have to say? Well, they wrote a ticket to the driver of the car for failing to yield the right of way. They did not see a double parked truck at the scene but they documented that witnesses claimed such a truck had been there at the time of the accident. Should the trucking company be held liable for this lady's death? Let's first talk about the driver of the car she ran into. Its driver could not see traffic at all from his position at the stop line near the stop sign. He stopped. Then he moved very cautiously into the intersection. What else could he do? Should he have remained stopped until the double-parked truck, if it was actually there, moved out of the way? If his wait had lasted an hour, should he have been required to remain in place still longer? He certainly DID fail to yield the right of way. His ticket was 'righteous'. But it was unintentional and there were extenuating circumstances that any jury would understand. When he finally did see the motorcycle it was too late for him to do anything to avoid the collision. Even if he did have insurance, was it likely that it would pay handsomely because of the death of the rider? Well, that goes back to the issue of contributory negligence, doesn't it? So now it's time to look at the motorcyclist's responsibility in this matter. We learn that she was properly licensed (had a motorcycle endorsement on her license) and that she had taken and passed an MSF class. We begin being critical by acknowledging that she was driving too fast. She was traveling at least 40 mph when she crashed and it was a 30 mph zone. But just how important was that in the bigger scheme of things? I mean, had that double-parked truck not been there, then the accident probably would not have happened at all, right? So what if she was speeding a little bit, just like you and I do every time we drive or ride? Time, I guess, to look at some details. Let's start with that skid mark. It was 40 foot long. Obviously that means that the rider noticed the car when she was traveling faster than the speed of impact because she scrubbed some speed during that skid. But how much faster? The police determined that the Dynamic Coefficient of Friction between the bike's tires and the roadway was 0.79. No grade, no rain or ice on the ground, middle of the afternoon with good lighting and no weather issues. How much speed is scrubbed during a 40 foot skid under those conditions? Pay attention here, please. A skid mark does not tell you how fast a person was traveling during that skid. The skid mark ONLY tells you that a certain amount of energy was transformed during the skid. That is, a certain amount of kinetic (moving) energy was converted into heat during the skid. It doesn't matter how fast the person was going during the skid - essentially the same amount of energy is converted regardless of speed. The faster you go, the less time it takes to scrub that energy, but the amount of energy converted is essentially the same. But we do know some other things about a skid mark other than its length. We know that it results from a locked brake and a skidding tire, and that a brake does not lock by itself, normally. That is, it took an effort on the part of the biker to lock her brake. By the way, we also know that it is almost always true that a skid mark is from the rear tire of a motorcycle because if it is from the front tire, the bike loses all control and quickly ends up on its side. Ever heard of PDR? That stands for Perception, Decision, Reaction time. Before you can lock your brake(s) you must first perceive a need to do so, decide to do so, then move your hands and feet to the levers as a reaction to a threat. The amount of time it takes to do that is called PDR time (or, in some places, simply PR time). Tests have been conducted that document that professional riders who KNOW that a threat is about to present itself (a signal light is about to change colors, for example) CAN have a PDR as low as 0.2 to 0.3 seconds!!! However, those same riders take on average about 1.5 seconds of PDR when a threat is not anticipated (a car ahead suddenly begins skidding its tires). Indeed, about 70% of all motorists take about 1.5 seconds to begin applying their brakes when a threat is NOT anticipated. We can assume, therefore, that the lady riding her bike that day took about 1.5 seconds to begin applying her brakes. Well, there is a little more reason to support that assumption. You see, witnesses claimed that she had been stunting her bike prior to the accident. That is, she had just done a wheelie, and when she came off that wheelie she began accelerating. You MUST conclude that she did NOT anticipate the presence of a threat at the time. So, now what do we know about how fast she was going before she began her skid? We actually have enough information to make that call, but we want something else to increase our confidence in it. Fortunately, we recall that witnesses claimed to have seen her going between 30 mph and 50 mph just before she crashed. Since we have very good reason to believe that she was going at least 40 mph when she did crash, we know that the low end of those witness estimates was too low. She had to have been traveling in excess of 40 mph before she started skidding, but if the witness estimate was believable, she could not have been traveling more than 50 mph. In other words we have excellent reason to believe that she was traveling at about 45 mph before she began her skid. Can we confirm that with the skid length evidence? You bet. A skid would be 40 feet long if the rider used 100% braking efficiency (i.e., both brakes maximally applied) and came to a dead stop (without a collision), if she started skidding at just under 31 mph. Had the braking efficiency been 60%, v would equal 23.85 mph. Since there was only one skid mark it is not possible that she used 100% braking efficiency. Had she used only her rear brake she would have been able to attain no more than 40% braking efficiency as at that point she would have transferred virtually all the weight off her rear tire and no more braking was possible. Because she was faced with an imminent collision we can assume that she used at least SOME front brake along with her rear brake. Since the MSF tests braking skills to determine if even a rank amateur (newbie) can achieve a 60% braking efficiency, we can be confident that she used at least 60% and less than 100% braking efficiency during her skid. To be conservative, we will estimate that she used 60%. It is easy to calculate that if she used 60% braking efficiency, she had to have been traveling at just under 47 mph at the start of her skid. Obviously, the greater her braking skills, the faster she was traveling when she began skidding, but we took a conservative approach to this analysis. It is entirely proper and defensible, assuming rounding of numbers, to conclude that she was traveling at no less than 47 mph before she began her skid. In other words, her 40 foot skid scrubbed approximately 7 mph off her speed. Now we have enough data. Using a 1.5 second PDR and a speed of 47 mph, we know that the lady traveled 103 feet before her skid started. That means that the lady FIRST NOTICED the car in the intersection when she was 143 feet away from it (40 + 103). 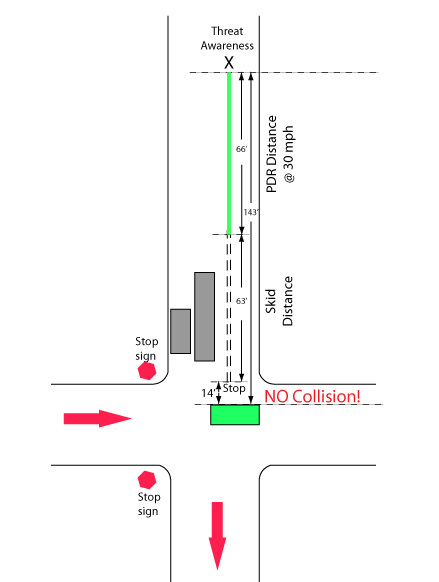 We just learned an interesting fact: Had the car driver simply crossed the intersection at normal speed instead of creeping along, since she crashed into his car near its rear, the accident would not have happened. That is, had the car driver acted irrationally, there would not have been an accident. Yeah, but so what? He did act rationally and the accident did happen. Well, doing a 'what if' makes a lot of sense when trying to determine proportionate negligence, as I'll now show you. What if the motorcyclist had been traveling at or below the speed limit? We know that no matter what her speed was before she locked her brake, she could and did see the car when she was 143 feet away from it. If she had been traveling at 30 mph, then she would have traveled 66 feet before her skid began. That means that she would begin skidding 77 feet from the car. And that means that she would NOT HAVE COLLIDED as she would have come to a dead stop within 63 feet, or 14 feet shy of hitting the car. In the language of the law, and what any jurist would understand ... Were it not for her speeding, there would not have been an accident. Said differently, whether there was a double parked truck or not, this accident would not have occurred if the lady had not been speeding. 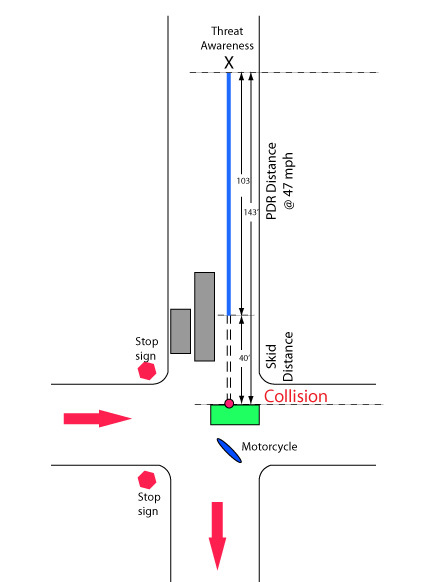 Speeding killed this rider, not a car driver who crept into an intersection, and not as a result of a double-parked truck, whether it was there or not. The payment awarded to the estate of the motorcyclist would almost certainly be ZERO dollars. Who killed her? She did.